FARMINGVILLE & STONY BROOK, NY, October 8, 2010 – Supervisor Mark Lesko and Stony Brook University President Samuel L. Stanley, Jr., M.D., announced that the Town of Brookhaven has become the newest member of the University’s National Science Foundation (NSF) Center for BioEnergy Research and Development (CBERD). 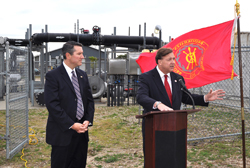 This new partnership is expected to be very beneficial for the Town’s landfill gas management program by increasing its potential as an energy and revenue source. Also present were Stony Brook Professor Devinder Mahajan, a Professor in Materials Science and Engineering who also serves as the Co-Director of the Chemical and Molecular Engineering Program, and David Tonjes, Assistant Professor in the Department of Technology and Society.